Imagine being a baseball player who gets to see just one pitch. That’s the situation facing most hernia sufferers who require surgery. This is a get-it-right-the-first-time situation (or else). Now, double down on this scenario for seniors who are suffering from a specific type of hernia. Hiatal hernias are most often found in people in their 70s and 80s. Many are treated with medication. But, in the tougher cases, doctors recommend surgery. Hernias are “a hole in something that allows things to poke through that typically should not,” Dr. Rosen says. Hiatal hernias are located in the diaphragm where the esophagus joins the stomach. They typically cause heartburn and reflux. If the hernia just makes you uncomfortable, doctors will treat it with medications, Dr. Rosen says. But more serious hiatal hernias, also known as paraesophageal hernias, become larger over time and the stomach starts to rise farther into the chest. 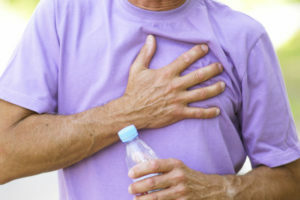 This sometimes causes significant chest pain after eating. It can even cause weight loss and bleeding, Dr. Rosen says. In those cases, surgery is usually needed, he says. It’s best to ask your doctor about treatment as soon as a hernia begins to cause discomfort. So why is that first surgery so important? An unsuccessful surgery is frustrating for the surgeon, but even more so for the patient because of the resulting poor quality of life. The symptoms bothering you in the first place return. Risks associated with remedial surgery include recurrent heartburn, difficulty with swallowing, increased bowel symptoms and nerve damage. Working with an experienced surgeon is best for any hernia patient. But surgeries for recurrent hernias – especially in older patients – are even more complex and challenging. If you reach the point where you need hernia surgery, it’s important to go to a comprehensive hernia center to get the best treatment. With expertise in both minimally invasive surgery and large comprehensive surgery, a dedicated hernia center helps ensure the operation is done right the first time, Dr. Rosen says. Advances in minimally invasive surgery mean that, for many patients, hernia surgery is no longer a major operation that puts you in the hospital for a week to 10 days. Patients now typically go home within a couple of days, Dr. Rosen says. In most patients, the cause of a hernia is not known. An injury, straining or weakness in the area may contribute. Two other types of hernias can impact the elderly but are no more likely to occur later in life than at a younger age. Ventral hernias, which occur in the abdomen, also exhibit a bulge and pain. “Those will not go away, either,” he says. “There’s no way to prevent them.” Having said that, Dr. Rosen adds, ventral hernias are more common in people who are obese, or who have diabetes or chronic smoking habits. “Being in general good health reduces the chances of those kinds of complications,” he says. Do Your Testes Hurt — But You Don’t Know Why? What Are the Best Options for Laser Vision Correction Surgery?